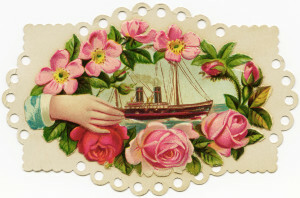 Another beauty courtesy of the Old Design Shop, a vintage image treasury. The black waves froze darting shoals. We’ve come to the end of our time. I’m in the mood for sailing seas. The forthcoming Tall Ships Festival at Greenwich strikes part of me as something interesting. Today it’s been a drizzly bank holiday Monday. I shall be off in a moment. All else that I’ve done with today was sort my closet, repair some clothes and leave the house to forage at Budgens. I returned a packet of marked down asparagus, half-a-dozen eggs and a bag of apples. I still need soya milk for tomorrow’s bowl of breakfast oats. I’m in the mood for catching high winds. “Look At“, a poem posted this time last year, is a combination of a journal poem and a pavement poem. Derived from mental notes taken during a walk along East Finchley High Road, it documents the comings and goings of an ordinary morning. Observing the ordinary and everyday is a recurring theme. “Look – really look” takes a similar approach, but places the entry within a specific season (summer) and circumscribes it to a smaller location (one man’s balcony garden). “Look At” is one of the 104 poems that feature in my latest book, In the Ocean. The image of fish scales is courtesy of Wikicommons Media and photographed by Rajesh danji. View the original image here. Image thanks to Wikimedia Commons, contributor: Siebrand. This work is in the public domain in the United States because it was published (or registered with the U.S. Copyright Office) before January 1, 1923. Click on the image above to read these two poems from the archive. This poem about scales is a mash-up of ideas about old flames and red herrings. Strangely, yesterday I also wrote about sea creatures. In ‘New ink cartridges‘ I paired cephalopods with writing in black ink. The image of fish scales is courtesy of Wikicommons Media and photographed by Rajesh danji. View the original image here. You can view Rajesh’s work on his photo blog, Banglore Photo Daily. Another illustrative gem courtesy of the Old Design Shop, a vintage image treasury. Eating right is important for an artist. Even Ella Fitzegerald and Louis Armstrong advocate this in ‘Frim Fram Sauce’. In truth, though, I am fish cakes and rye bread kinda girl. That’s why I like a bit of salad with mackerel. This image, ‘Summer Vintage Woman,’ is courtesy of CherishedMemories. A few recent poems have orbited around summer. 29°C captures some moments from the July heatwave. Another Summer’s Day explores more delights of the warmer season. Summer food and outdoor eating, which we enjoy at such times with childlike relish, are enacted by the child characters who feature in Packed Lunches and Summermelon. Tightly Sealed and Look At draw on observations of ordinary days as they continue to unfold during a suburban summer. Leftovers accumulate in the ‘fridge. Residents must still go to work and pick up groceries on the High Street. An Arrangement of Strangers, a poem about some childhood fears, proved the wildcard. I consider Recycled the most beautifully put together of them all. Tarantella, which might seem to be about spiders, but also mentions a fish. Thematically, all these poems explores internal and external movement. “red herring”considers the pause of such movement; “Tarantella” the motion. Conversation describes the setting of an event, but hints at the ebb and flow to be found in relating. The only way to cleanse yourself? At the moment I seem to be on a fish theme, which is now branching into spiders. Of course, these are mythico-fictional animals. The creatures that feature most regularly in my life are the bumblebees who love the gutter outside my window and the dogs walked by their owners in a local wood. For more of my poetry, preview my recently published first volume: SHINING IN BRIGHTNESS. I tweet regularly as @BeadedQuill.